JYM Supplement Science combines real science with real ingredients to deliver unreal results. Post JYM, my revolutionary post-workout recovery formula, delivers the ingredients you need after every workout to promote those unreal results. * It's a powerful post-workout cocktail scientifically- designed to help you boost repair, maximize recovery, and build more muscle. Post JYM Active Ingredients Matrix also contains carnitine and glutamine, which are important to quickly ramp up post-workout repair. * In addition, you can also purchase Post JYM Dextrose separately. This way Post JYM lets you control your carbs and customize your post-workout protocol. 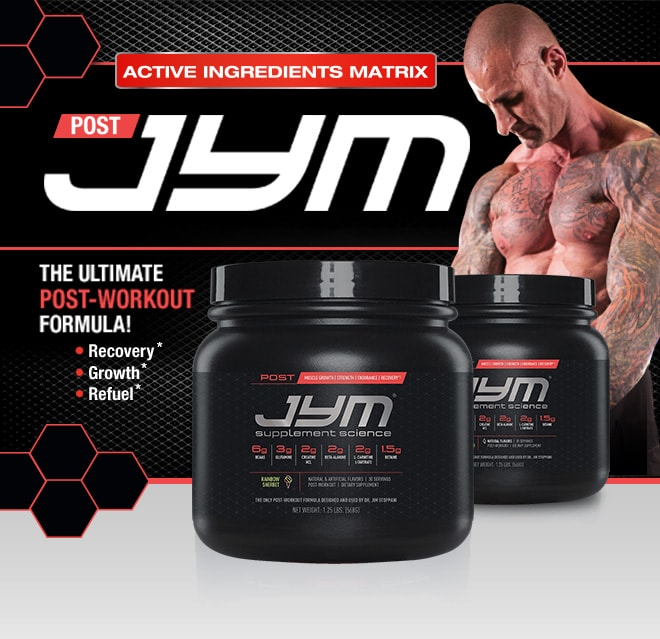 Like every JYM product, Post JYM Active Matrix contains no proprietary blends, proper amounts, no abbreviated formulas, no concentrates, and no BS. There is no filler. Every single ingredient is included at the studied amount to optimize repair and growth. * That's the power, and promise, of Post JYM Active Ingredients Matrix.